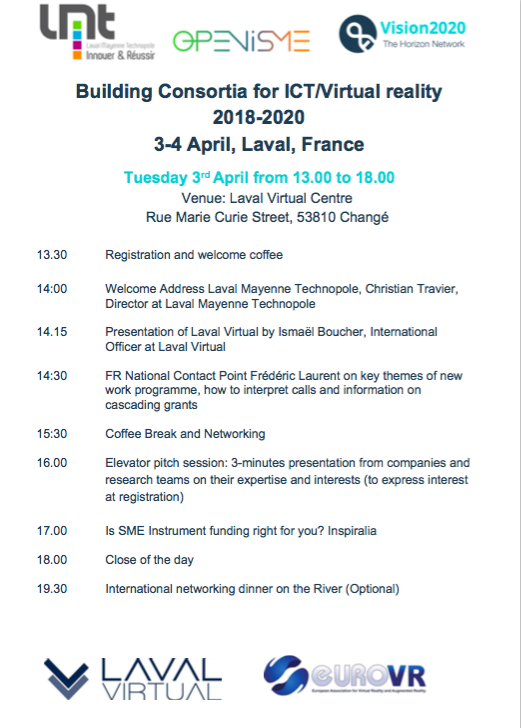 Vision2020 in collaboration with Laval Mayenne Technopole has organized an event during Laval Virtual International Conference, in order to build ICT consortia. The aim was to invite SMEs and academics from whole Europe to discuss about collaboration activities and answering to European Call for proposals. It was an opportunity to present OPENiSME during the opening Conference and invite participants to use it to find partners for the next European Projects. Laval Virtual International Conference is an event in which every year participate more than 300 exhibitors and 20.000 visitors. During the Conference specific calls related to ICT and Virtual Reality across the Horizon 2020 Work Programmes are analyzed.